Think there are too many smartphones on the market? Well, get ready for one more, though don't write this fresh face off as just another wannabe-flagship killer yet. 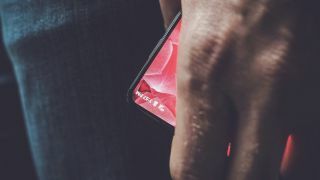 Andy Rubin, best known as the creator of Android, on Monday tweeted an image that shows a fragment of a phone he's reportedly developing, teasing we'll see the device go on sale before long. We first heard inkling of the phone in January, when it was reported Rubin had formed a new company called Essential. The handset, described at the time as high-end, is said to be the marquee device in a number of rumored consumer products from the firm. According to the January report, Essential's phone has an edge-to-edge display, no bezel, a ceramic back and a charging port that lets users add-on hardware accessories. It's also said to be backed by a robust artificial intelligence. While the tweeted image doesn't vouch for all of these features, it does show a phone with barely any bezel and a display that stretches almost to the edges. From what we can make of it, the phone looks like a sleek, flagship-type device, one that could potentially compete with the likes of iPhone, Google Pixel and the soon-to-be-announced Samsung Galaxy S8. Though we get a glimmer of the phone's screen, it's hard to speculate whether the phone is running on Android or an operating system developed by Essential in-house. That remains a key question surrounding the phone. Other questions, of course, are when the device will launch and for how much. It was previously reported Rubin's latest creation could go on sale by mid-year at a cost that rivals the iPhone 7 price of $649/£599/AU$1,079. One last query: Will Rubin give us more bait to chew soon, or is this our last look before a big reveal? When building hype for a brand-new product, our bet is on more hints dropping before the phone becomes official.